From left to right: Manolis Merakos, Jacob Mongenais, Martin Gravelle, Patrick Legault, Marc-André Caron, Mélissa Jimenez, Florence Bédard, Dominic Monette, Marcel Girard, Kevin Gravel, and Professor Patrick Dumond. 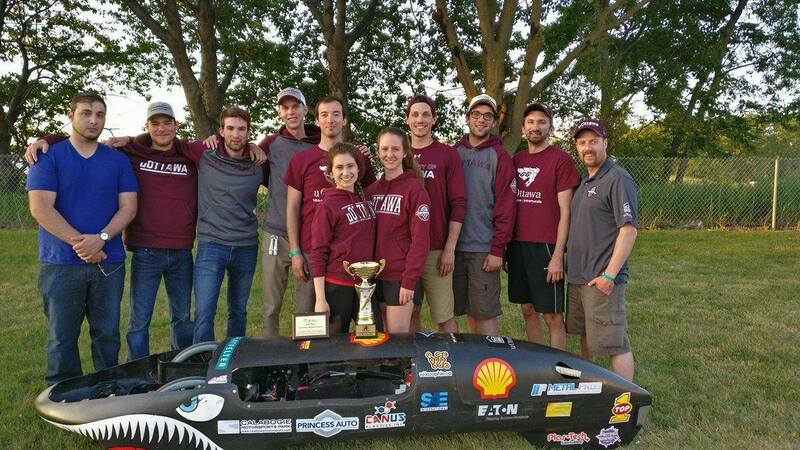 On June 7, uOttawa’s Supermileage competed against 17 other super fuel-efficient prototype vehicles, aiming to obtain the highest combined kilometres per litre (miles per gallon) rating in the 2017 Supermileage SAE Competition, in Marshall, Michigan, USA. The team ranked 12th overall and was awarded 1st place for Design Report and 2nd place for Innovative Solutions. The Design Report Award was given to the team for the quality of their written and verbal report, while the Innovative Solutions Award highlighted the creative ways in which the team overcame challenges they faced throughout the engineering and design portions of the competition. This last award is especially well deserved, as the team innovated by modifying their prototype vehicle, after having ranked in fifth position in last year’s SAE competition. This year, the team completely changed the engine in a month’s time prior to competing. "There are two ways to go about this competition: you can either repeat what we did last year, without too many modifications or you can try to innovate by using new technologies, but when innovating, it increases the risk of having complications, which is what happened to us this year," said Marc-André Caron, Team Captain. As for their future plans, uOttawa’s Supermileage Team is already preparing for their next competition, the 2018 Shell Eco-marathon, which will take place next spring, in California, USA.